The bechamel sauce can be made up to 1 day in advance and kept in the refrigerator. Place a piece of plastic wrap or waxed paper directly on the surface of the sauce to prevent a skin from forming. FOR CREAMED SPINACH: Place the spinach in a small saucepan and cover tightly. Cook over low heat for about 8 minutes, removing the lid for the final 3 minutes to evaporate the liquids. Drain. In another pan melt the butter, stir in the flour, then add the milk and whisk constantly to make a bechamel (white) sauce. Stir continually as it thickens. Season to taste with salt, pepper and nutmeg, then stir in the well-drained spinach and the cheese. Set aside, keeping warm. FOR EGGS: Poach the eggs until the whites are set but the yolks are still soft. 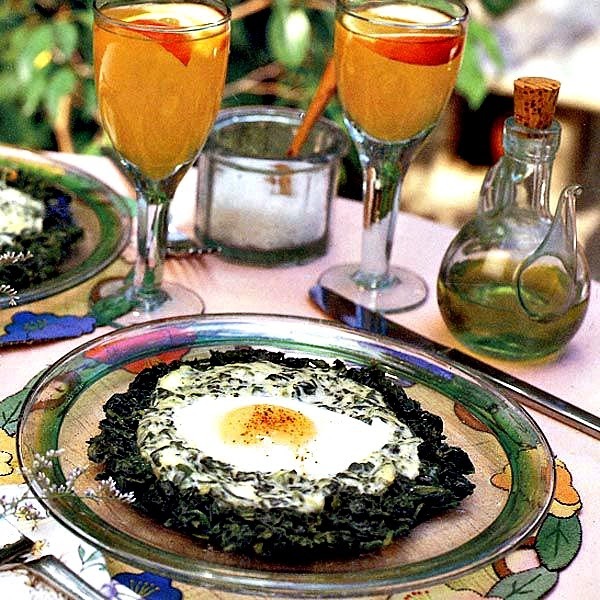 TO SERVE: Spoon a mound of creamed spinach in the center of each plate and make a well in the center. Remove the eggs with a slotted spoon and place one on each bed of spinach. Serve at once, with buttered toast.